The Sullivans: A Taste of Atlanta!!! Last week I tried two restaurants in Atlanta! They were both SUPER YUMMY and I highly recommend them!!! Wednesday night I went with Steph M and Amanda to Urban Flats. They have an event called "Wine Down Wednesdays" where you pay $20 for all you can drink wine! It was a great deal and we definitely took advantage of it! We shared their spicy rolls, tomato and goat cheese dip, and a sausage flat bread! As the evening wore on, they even played live music! I can't wait to take Ben! 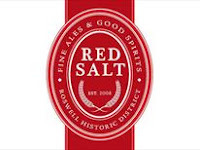 Thursday, I went with my friend Steph S. to Red Salt in Downtown Roswell. The place was packed so we knew were in for a treat! I absolutely loved the atmosphere, and the Chilean Sea Bass with Mashed Potatoes was out of this world!!! Since Red Salt is only a couple of miles from my house, I have a feeling I will be going there ALOT!!! Welcome to the World Carson and Henry!!! Fat Tuesday, Freezing Fargo, and Ice Hockey!! !